As far as design goes for your Lego cake, it can be as simple or as intricate as you want it to be!For example, the cake board can be covered with one colour sugar paste, or you can divide it intodifferent colours. 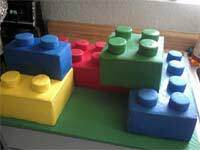 You can then use different coloured ‘bricks’ to build (literally) your cake, or use blocks of each colour on a base of the same colour. For example, if you decide to divide the cake board covering into a green quarter, red quarter,yellow and blue, you can build the cake up from these four base colours, using either the same colour or a mixture of them all. Watch your children as they play with Lego at home! Note a few variations of shapes and colours-as used by the experts-and scribble a few ideas on paper for your cake design. Cover a 30cm square cake board with rolled, readymade, sugar paste pre-coloured blue and leave it to dry.Make a 20cm square cake to provide plenty of bricks to play with! Preheat the oven to 170C.Beat the butter or margarine, then, add the sugar and beat together until light and fluffy. Graduallyadd the eggs, beat thoroughly as you add them, one at a time. Next, fold in the sifted flours and make sure all the ingredients are well combined. Bake in a greased, lined, square tin for about 50 minutes.When the cake is cooked, remove from the oven and leave it to cool in the tin for 10 minutes. Carefully, turn your cake out onto a wire rack to finish cooling. Cut the cooled cake into four equal-sized pieces and either cover with a layer of butter cream straight away, or cut into smaller squares, depending on whether you want to use solid blocks of colour or smaller, mixed, bricks. To make the circles on top of the bricks you can use a shop bought swiss roll or you can make a extra sponge cake (a small one). If you are going to use swiss roll cut it into slices and place on top of the bricks, sticking them in place with some buttercream. Alternatively you could make an extra sponge cake or tray bake and using a round cutter cut out circles and place them on top of the bricks, again sticking in place with buttercream. Once you have stuck your circles on to the cake roll a block of red sugar paste and cover one block, or several bricks with it. Do the same with all the colours, until you end up with blocks and bricks of all colours. Make sure the various pieces have space between them until you are ready to stick them into their final positions. Once you have your selection of bricks and blocks ready, the fun begins...Build a base square of red, yellow, blue and green blocks and press them together with a little edible glue if necessary. Build on this square by adding smaller blocks and single bricks in the pattern you have chosen-untilthey are all used. Don’t forget it is still a cake and will need to be cut and eaten at some stage!The idea is to make your cake look as much like a board of Lego as possible.